Part 5 of 6 of the Assassin Nation Plot. Tensions are high between the US and Symkaria, as the Symkarian people believe the C.I.A. had some involvement in the murder of their Prime Minister. We all know, though, it was actually Sabretooth who killed him, but without concrete proof, that information isn't worth anything. So its up to our spandex clad heroes to grab the proof and release the tensions between these two powerhouse nations before All Out War starts up. (See what I did there? I'm a mess, plugging my other reviews, I'm terrible.) We open up with a whole bunch of Ultimatum Soldiers wrapped up in Spider-Man's webbing, ready for a good questioning for information. Spider-Man is teaming up with Solo to get the whereabouts of Toler Weil, a high ranking Ultimatum Soldier. The questioning doesn't go as planned, or at all, when Solo ends up killing the entire group, shooting them out after seeing one of them pull out a gun behind Spider-Man's back. He obviously didn't know about the Wall-Crawler's Spider-Sense. What a jerk, he didn't even ask. Shame. So Spidey bails, since this lead has hit a...dare I say it...dead end. Wonder how things are going for Captain America and the Silver Sable. They've got a lead in Mexico and that's exactly where they are. In a plane flying over our neighbors to the South. They're on the hunt for the mutant murderer himself, and they find themselves face to face with some Mexican cartels in the jungle. After some roughhousing, one of the cartels not only offers to tell the team where Sabretooth is, but he's willing to take them to him personally. Meanwhile, Spider-Man and Solo meet up in a park, following another lead. We can only hope that this time it will be dry and deathless, but anything can happen with this loose cannon Solo on the job. Back in Mexico, Cap and Sable stake out Sabretooth's location. Before they can attack, the cartel who brought them tries to signal his men, and succeeds! He burns a nearby tarp with his cigar and before they can blink, our heroes are surrounded by more men. In the chaos, Cap sees Sable run after Sabretooth and follows her. He's not quick enough though, as Cap shows up, Sable's already tricked Sabretooth into crashing through a weak wall and bringing it down on him, killing him. The murderer is now dead, and hope seems slim without him being able to make a confession. Now, everything sits on Spider-Man and Solo getting a LIVE body to make a confession. Spider-Man encounters some suits of armor inside the museum he was told to go to. Not even Solo's bullets are hurting them! It isn't until Spider-Man notices that the guards are protecting a door that the fight takes a turn in the heroes favor. Solo blinks out of the fight and into the room, trapping the man inside. Before Solo can kill him, he gives up the location of Weil, on the roof making a move for his helicopter! Time is running thin and Spider-Man sees Weil escape the room and head for the roof. Its not long before the Web Head catches up to him on the roof just as a mechanic with a welder hits a tank of acetylene by accident, causing the tank to blow up and knock both Weil and Spider-Man off the roof! Luckily, Spidey's got those handy dandy web shooters and catches Weil and webs them both to the building, hanging by a thread. Solo shows up and tries to convince Spider-Man to drop him and kill him, but he doesn't. Something Solo calls weak and walks away from his dangling partner. the next day at the Symkarian Embassy, Cap, Spider-Man and the Silver Sable meet up to regroup. Weil hasn't made a confession yet, but it may be too late, as it was just announced that the Symkaria has formally broken all ties to the United States and rumors are spreading that Symkaria is sending murder squads into the US to as retaliation for the murder of the Prime Minister. There's one chapter left and so far, each issue is getting my blood pumping. New developments every page, the twists, the turns, the deaths, the action. MAN this is great! 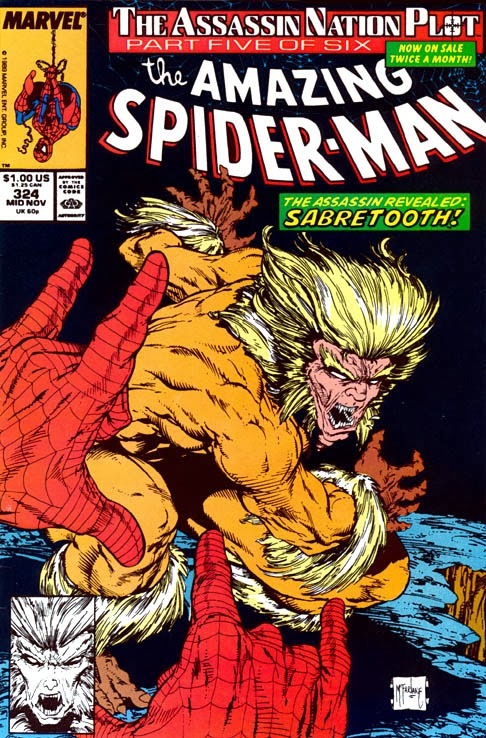 With Sabretooth dead, will we see a civil ending to this potential war? You'll just have to come back and click away in a week to find out the exact answer, until then readers!! !